Welcome to Petrosul International - the only sulphur marketer exclusively serving the needs of the Canadian sulphur industry! Petrosul is a privately held company with its head office in Vancouver, British Columbia. Petrosul has been a sulphur aggregator and marketer for more than 40 years. 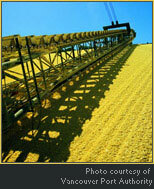 We are the only sulphur marketer to have consistently served the needs of Canadian producers for the past four decades. Petrosul’s annual sulphur volume typically ranges between 1.1 million and 1.5 million tonnes, which are marketed to a variety of phosphate fertilizer and industrial users in major consuming countries throughout Asia, Africa, Latin America, Oceania, and North America. Through our ‘in-house’ expertise and affiliations with several sulphur industry experts, Petrosul is able to provide its customers with detailed information on the world sulphur market, sulphur quality, production, usage and handling, and other issues affecting sulphur. We are excited to announce our participation in constructing and operating the 1st new sulphur forming and handling facility in Alberta in over two decades - the Heartland Sulphur Terminal. Please see www.HeartlandSulphur.com for more details. Please click on the links above for details on our Management, Operations and Services. Petrosul was originally incorporated in Vancouver, British Columbia in 1975. Built, owned and operated three sulphur forming plants in British Columbia and 1 in Alberta. Operated a fleet of 200 railcars and managed a 100,000 tonne sulphur stockpile. Established an office in Calgary in 1984 to better serve the needs of Alberta sulphur producers.